How Much Compensation Can I Claim For A McDonald’s Accident? How Much Compensation Can I Claim For A McDonald’s Accident Claim? Whether you are dining in one of McDonalds 1,249 UK restaurants and drive-throughs or getting a takeaway you may have suffered an injury and need to make a McDonald’s accident claim. Whether you are dining in or getting a takeaway, fast food is one of the most popular ways to dine in the UK. One in six young people eats fast food twice a day in the UK. In England alone, they are buying those meals from 56,638 fast food restaurants which account for around a quarter of food outlets in the UK. Accidents and injuries can happen in high street fast food and takeaway restaurants such as McDonald’s. 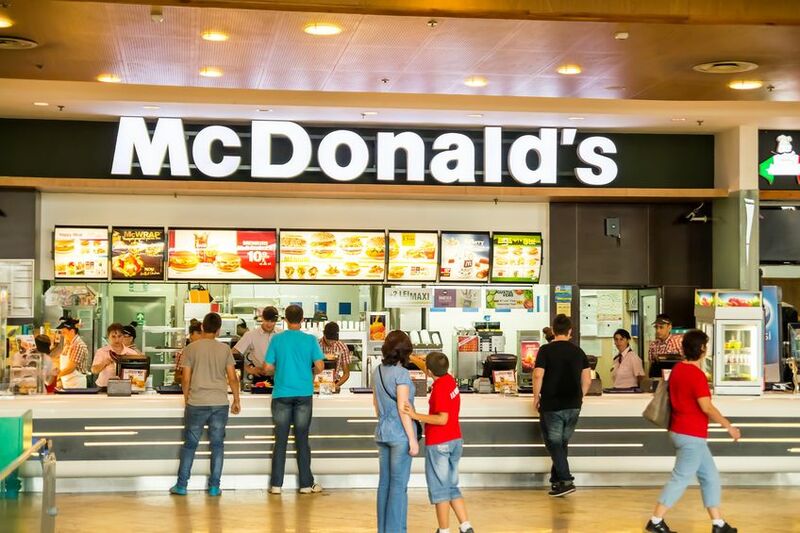 Whilst diners always have an expectation that the restaurant owner (or franchisee in the case of McDonald’s) has taken due care and attention to make the experience risk-free, that is not always the case. As any fast food restaurant can be very busy, it is almost inevitable that there will be accidents now and then. Accidents in fast food restaurants can happen to staff and customers alike. Common McDonalds accident claims might include slips trips and falls, illness due to improperly prepared or cooked meals, wet and/ slippery floors in the toilets, burns (either from food or beverages being too hot, or obtained whilst preparing the food), and other physical injuries which you may have obtained whilst on the premises. Whether your McDonald’s accident happened as an employee or as a customer, restaurant managers, owners, operators, and franchisees are legally required to take ownership of operational procedures which are designed to ensure diners safety. Customers and staff must be adequately protected from risk. In this guide, we take you through advice and the steps you need to take to make a personal injury claim against McDonald’s when you have had an accident or injury on their premises which was not your fault. What Are The Main Types Of Accidents At McDonald’s? Have You Had a McDonald’s Burn Injury As a Staff Member? What Should I Do If I’ve Had A McDonald’s Accident? How Much Can I Claim For An Accident At McDonald’s? Why Choose Us for Your Accident At McDonald’s Claim? McDonald’s restaurants are generally owned and operated as franchises. These are operated by individuals or companies on twenty-year leases. Like with other fast food or coffee shop brands, often franchises are owned by a company or individual which operates several branches. These businesses or business owners will be the party responsible for maintaining a safe environment for staff and customers to work and dine in. They will also be the party any personal injury or accident at McDonald’s claims should be made to. The branch owner/ operator should be clearly displayed on a notice in the branch where both staff and customers can see it. If you have had an accident, such as a slip, trips, and fall McDonald’s injuries, these are the party you will commonly need to make the claim against. As with many public spaces, sometimes fast food restaurants can be an unsafe place. There could be an issue such as an uneven floor or a broken railing on the stairs. No matter what the circumstances are, the restaurant franchise owner(s) have a duty to ensure that members of the public are safe during their visit and that employees have a safe working environment. If an accident is caused due to a spillage which is not cleaned up, or if another environmental factor causes the injury, you could be entitled to claim for your McDonald’s accident. Accidents and mishaps can happen without being anyone’s fault, either guest or staff members. If you have had an accident, which was neither your fault or that of anyone else directly, you may still have a legal right to make a compensation claim. Debris: there can be a world of hazards which can cause a McDonald’s accident. Things such as boxes, packages, and pallets as well as roll cages and rubbish can all cause injuries and accidents. Food, liquids or spillages which are left on the floor, in walkways or the walking spaces in the restaurant or the preparation spaces and even the car park can cause slip, trip and fall injuries. Wet floors and slips: leaking items, drinks and lots of products in the kitchen, as well as equipment like leaking fridges and freezers, can all cause hazards. Customers and staff can also bring water in with them, from their shoes or clothing in wet weather. Restaurant seating: faulty or defective chairs, bench seating or stalls can cause slip, trips, and fall McDonald’s injuries if they collapse or break. Sharp objects on broken seating or chairs can cause lacerations or cuts which you can claim for. 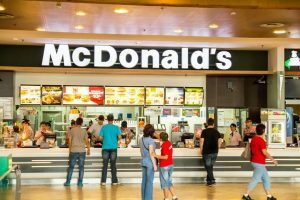 Food poisoning in McDonald’s: cases of E Coli and food poisoning can be caused by improper preparation or cooking of food or drinks. It can also be caused by incorrect storage of food or drink items. Ice snow and other environmental factors in spaces such as car parks: ice or snow in a Mcdonald’s car park or drive through can cause trips, falls and slips or cause people to have minor car accidents due to skids. Other accidents can be caused by things such as a loose manhole cover or drain or pothole in the car park can cause people to trip, fall or slip and injure themselves on the restaurant’s property. These can all lead to claims for compensation for an accident in McDonald’s. Understaffing or poor training: understaffing can lead to little or incorrect monitoring and supervision of potential hazards. This can make accidents more likely to happen. Improper staff training can also lead to staff not carrying out their tasks or using equipment correctly. Burn injuries: a McDonald’s burn injury to a customer can be caused by overheated foods (such as the McDonald’s Apple Pie) have caused burn injuries if too hot, or if spilled onto a person. Cleaning: if the kitchen or public spaces are not cooked correctly, customers and staff can both be put at risk of contamination or illness. Toilets: faulty toilets can lead wet floors and flooding. Issues and injuries can also be caused by leaking pipes and taps or incorrect baby changing facilities. Poor health and safety procedures and considerations, whether it is not correctly maintaining fire exits or poorly created and maintained disabled facilities in the branch can cause injuries to both staff and guests alike. The Health and Safety Executive has produced a comprehensive guide with everything you need to know about identifying health and safety hazards in a fast-food restaurant as well as clarification of the laws covering restaurant staff and customer health and safety practices. Improperly following these guidelines can leave to slips, trips, and fall McDonald’s injuries. Improper health and safety procedures, such as inadequate signage in the restaurant or the car parks can lead to injuries and accidents. Not adequately maintaining things such as entrance ramps can lead to people being injured. If you are a business owner or manager looking for more information and advice on health and safety procedures for restaurants, this Food Hygiene and Health and Safety for Businesses PDF can help you identify and address things through Hazard Analysis and Critical Control Points. Restaurants and fast-food eateries have a duty of care to keep customers and staff from having slips, trips and falls on their premises. Employers and business owners have a duty of care to ensure that they create and maintain a safe environment for guests and staff. Floors should be kept free of any debris or other objects and spills or foods on the food should be cleaned up straight away. Hazards and other objects should either be cleared away or clearly highlighted as hazards, ensuring customers or staff can safely avoid the obstacles and move about pathways. In certain cases, even when there is a warning sign to let people know about a hazard (such as a wet floor), you may still be entitled to make a compensation claim. If the measures the restaurant has put in place are not sufficient to reduce the risk of, or prevent, an accident then there could be a case for a claim. Examples can include if the signage is insufficient or has been there for a long time. Hot cooking oils, fats, and grease as well as spills of these. Hot liquids, such as sauces, as well as steam. Hot cooking surfaces and equipment. A Mcdonald’s burn injury can be a serious injury and need speedy medical attention to ensure permanent or lasting damage is minimised. The NHS has information on how to immediately treat a burn injury. The lack of PPE or ‘Personal Protective Equipment for all staff members in the kitchen or whether serving customers can result in staff suffering from skin or body accidents including lacerations and cuts. Injuries from accidents in fast food restaurants overall range from simple cuts and bruises to even more life threatening and life changing injuries. Anyone working with hot cooking equipment, such as ovens, grills, fryers can be at risk of serious injury if and when anything goes wrong. This risk is even more so if they do not have the correct PPE equipment. Fast food staff are often working under a lot of pressure to deliver results in strict time constraints. If you are instructed to use equipment without the proper training or safety equipment, you could end up being injured and have grounds for a claim for your accident at McDonald’s. Resulting injuries can include being badly burned or scalded. Things such as hot oils can cause burns to part of your body and leave permanent scarring. Slip, trips and fall McDonald’s injuries are also quite common, as with other fast food and restaurant workers. Whether your slip is caused by food or drink in the kitchen, restaurant space or other parts of the premises, these are still the responsibility of your employer. If you feel that your employer has not done everything they can to provide a safe working environment for you, and have been injured as a result, talk to us today and start your McDonald’s accident claim. There is a reason why food poisoning is so common, it is relatively easy to make a mistake when preparing foods and beverages. Fast food is prepared quickly meaning there are more possibilities for it to go wrong, such as undercooking or not correctly defrosting ingredients. Food preparation and cooking areas can also often be cramped and have poor sanitation conditions. These can lead to food poisoning in McDonald’s claims. Make a formal complaint at the restaurant and ensure they log it in the correct incident book. Note down the details of any witnesses who saw you eat and get ill. If you can keep a sample of the food which made you sick, even better. Talk to a solicitor as soon as you can after the first four steps. If your accident or incident has happened in a fast food restaurant, such as McDonald’s, their car park or wider premises, then the business is liable for your injuries. You should make a claim for anything such as loss of earnings, medical costs and general expenses. The claim will most likely be lodged against their public liability insurance policy. The very first thing you should do is report the accident, injury or food poisoning to the manager or if possible owners of the business. This will then be recorded in their accident/ incident log book. At this point it is always a good idea to get a photo of your injury as soon as you can, this shows it in the immediate aftermath of the accident. Use a ruler to show the size of the injury. If your injury was a slip, trips, and fall McDonald’s injuries then also take a picture of the object or pothole which caused it. Again use a ruler if possible to show the size of this hole, the debris or object involved. Also, take photos of any inadequate markings or signs which were displayed. The photo should also show their general surroundings. Depending on the severity of your injury, it is a good idea to visit your GP or doctor. They can take an accurate medical log of any injury you have suffered as well as the reasons why it happened. This will help to support your McDonald’s accident claim compensation case. In order for us to ensure that the negligent party pays out your compensation claim if you are successful, it is a good idea to record any and all expenses. Keep receipts and details of things such as travel expenses, costs of medications and any loss of earnings. Conditional fee agreements are more commonly known as ‘no win no fee legal agreements’. These agreements are a contract between your solicitor and you. They help people to make compensation claims without having to worry about paying for costs and fees. They mean those on low incomes don’t have to take loans. No win no fee agreements specify what you need to pay if you do win and that if you lose, you won’t have to pay. This reduces the risk of having to pay legal fees or may people who have had an accident at McDonald’s. There are no hidden charges or fees and you will know exactly what you are signing up for. Being offered this kind of agreement is contingent on a solicitor accepting your case. We developed a no win no fee service to help those who need to get their compensation for an accident in McDonald’s claim heard. Find more information on how our no win no fee services is the right option for you. Solicitors and doctors will always tell you that no two accidents or injuries are ever quite the same. Estimating your compensation claim amount at an early stage is difficult. Where two accidents may look the same on paper, they can be different real life. Different injuries can affect people in different ways. Your claim will be affected by your injuries severity and long-term prognosis. Below is a table of possible compensation amounts. Facial disfigurement Significant scarring - Females £13,650 - £22,875 There is not a great psychological reaction. Resulting plastic surgery does leave some cosmetic disability, full restoration can not be achieved. Foot Injury Mild Up to £10,450 Including temporary damage to and pain in the foot. Foot Injury Moderate £10,450 to £19,000 The loss of normal function in one or both feet. Foot Injury Severe £31,900 to £53,200 Amputation (complete) of a single or both feet. Knee Injury Moderate Up to £19,900 Lasting damage or pain to one or both knees. Knee Injury Severe £19,900 to £73,125 Loss of function in a single, or both knees. Leg Injury Moderate £21,100 to £29,800 Loss of function in a single, or both legs (full leg). Leg Injury Severe £73,150 to £103,250 Amputation (complete) of one or both legs. Hand Injury Minor £700 to £3,300 A temporary loss of function and usage in both the hands. Hand Injury Moderate £4,100 to £10,100 Reduction in the function of the hands. Hand Injury Severe £22,050 to £47,050 Amputation of a single, or both arms. Until we have looked at your case, it is difficult to provide you with a compensation estimate. We have expert knowledge, working with some of the top claims solicitors in the country. As we have experience in working with or against many of the biggest insurance companies in the country, we know how to get the best out of your claim. We know how far a given insurance company will go to settle a compensation claim for injuries and accidents in fast food restaurants, such as McDonald’s. We also know what they will likely to be happy to pay you. We also know the types of tactics that different insurance companies and other businesses will use. Often the first offer made by the defendant you are claiming against isn’t the amount you should be getting in the end. We will always aggressively fight for you to get the compensation you deserve, ensuring you get the compensation and are repaid any out of pocket expenses you have had. We work with a dedicated team of personal injury solicitors who solely deal with these types of claims and have handled successful claims against numerous businesses. At Legal Expert, we are ready to work on your McDonald’s accident claim case. We can handle all kinds of fast food accident claims, and provide advice for people who have been injured as employees or as guests in fast food restaurants. No matter the type of accident or injury you have suffered, we can provide the advice and information you require. We can start by organizing an initial free consultation session where you can talk over the phone with one of our experts. Get in contact with us today. You can contact us by filling in our contact form or using the chat feature on our website. Alternatively, call our experts today on 0800 073 8804. We are ready and waiting to talk to start talking to you today. How Much For A Restaurant Accident Claim? How much compensation can you expect for an accident in a restaurant? Contact us today. If have you been burned in a restaurant, here is how much compensation you could claim for a restaurant burn injury.